Enjoy some of the finest hospitality available at the York Ebor Festival with our official packages inside the superb Dante Suite for all four days of the meeting. Please see our York Ebor Festival Hospitality page for all of our 2019 Dante Suite hospitality packages. 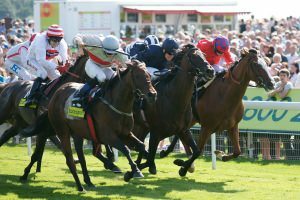 The Dante Suite is one the finest packages available for York Ebor hospitality guests. Located inside the main Ebor Stand it offers hospitality of the highest standards, including a private seated viewing balcony. Please note that due to sponsor requirements the Dante Suite is only available on the Friday of the Festival.